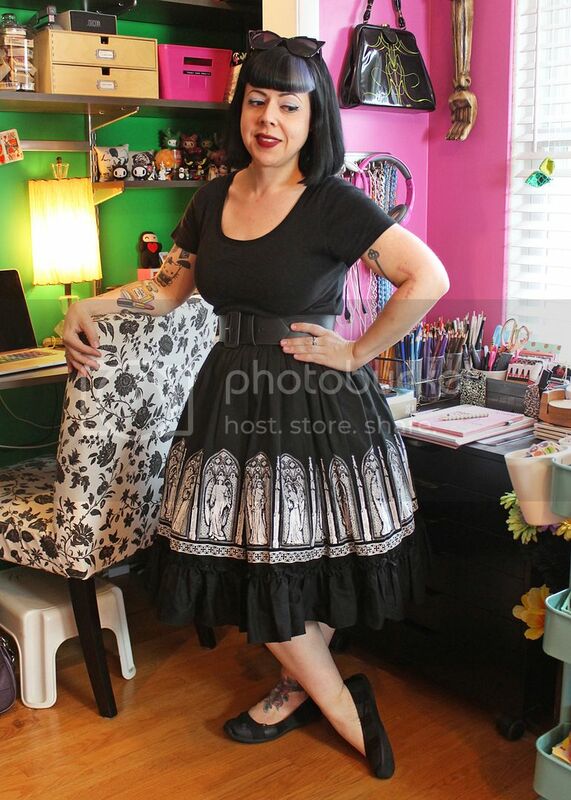 When I did my OOTD blog post with my other Restyle skirt, it occurred to me that I never did photograph a proper outfit post with this one, my very first Restyle skirt - the "Gothic Windows" skirt. This is (yet again) one of those things that I saw online (likely Instagram or Pinterest) and I had an "OMG I HAVE TO HAVE THIS" type of moment. Only to discover that it wasn't available anymore on the Restyle website. Being the obsessive shopper that I am, I dug around and dug around until I finally found one via an Australian website called Trash Monkey. The good news: I found one in my size! The bad news: I had to pay shipping from Australia! :( Whomp whomp. I wore this outfit on a trip downtown to visit my brother at work. We took Iggy on his very first train ride, which was pretty fun. I love watching his reaction and wonder when we take him on new experiences - I get to re-live being a kid through his eyes! 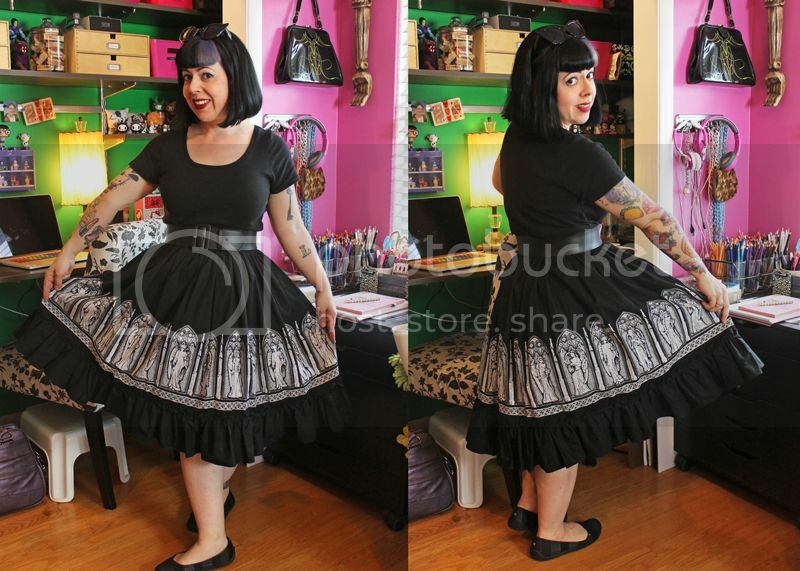 It was hot out, as usual, so this t-shirt/circle skirt pairing with bare legs and arms worked well for beating the heat. I went with a pretty darn neutral/matchy-matchy combo by just wearing a black scoop-neck t-shirt with the skirt. I would be meeting some of my brother's co-workers, so I wasn't sure how a heavy metal t-shirt might go over... I decided to err on the side of more conservative just for the day. Being home for the summer is nice, but I do have to force myself to get up and get dressed each day if I don't have something to immediately do that day (like on this day). Otherwise, I think that I would honestly stay in my pajamas and be a slug. That's no good. I've already gotten into the habit of coming home on days like this and changing from my skirt into PJ or yoga pants to hang out around the house. It's a blessing and a curse, really. 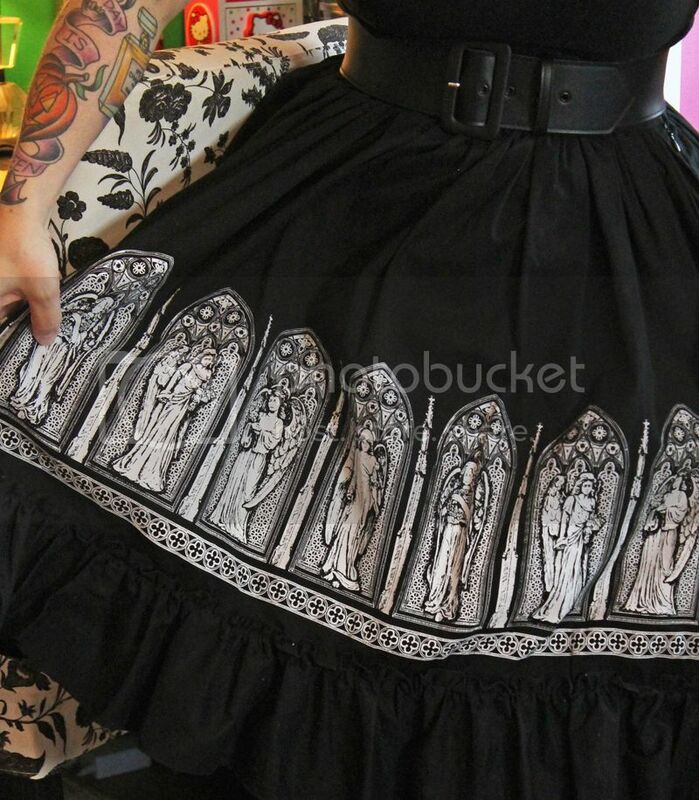 Above: a close up of the gothic window border pattern on my skirt. It reminds me of the 1996 Romeo + Juliet/angel phase I went through. I had a collection of angel statues, a wrought iron bed with angels and mosquito netting canopy, and even a set of white feather wings that I wore for halloween, paired with a long white medieval-style nightdress to channel Claire Danes' Juliet character at the costume ball. So, technically, I've been using movies as fashion inspiration for quite some time now...! I'm discovering that it's not that hard to stay cool and beat the heat while maintaining your personal style. The trick is to keep it simple: less layers and accessories mean less things to make you sweaty or touch your skin when you're already feeling uncomfortable. If you haven't already seen my previous post, check out Five Alternatives to Wearing Shorts in the Summer for more summer fashion options! Fashion and Fitness: What's Your Style? It's A Two Year Dress-iversary Celebration! Are Vivid Hair Colors Right For You? Summer Food: Awesome Fruit and Cheese Pairings! EPIC (and cheap) Vintage Yard Sale This Weekend!